Gyroporus is a very small genus of boletes whose members are easily recognized by their stems, which are brittle and hollow (at least towards the base in mature specimens) and their yellow spore prints. Like most boletes, they are mycorrhizal. They grow primarily east of the Rocky Mountains, but at least one species, Gyroporus castaneus, is reported in California; a few species range south into Mexico and Central America. Identification of Gyroporus species as they are currently defined is not difficult, and should not require microscopic analysis of specimens. Cap colors and textures, along with bruising and staining reactions, are the primary identifying features. A key to seven Gyroporus taxa can be found below. At present (2010) the genus Gyroporus seems to be holding its own in the current onslaught of DNA revelations--but, in a fascinating turn of events, species of Gyroporus appear to be more closely related to earthballs in the genus Scleroderma (together with Pisolithus tinctorius, and Calostoma cinnabarinum) than to most other boletes (except the oddball Gyrodon merulioides). An online Boletales cladogram by Binder and Hibbett (2004) compiles preliminary DNA results for hundreds of boletes; Gyroporus and its close relatives can be found in the Sclerodermatineae group. 1. Flesh staining (purplish, greenish, blue) when sliced. 1. Flesh not staining when sliced. 2. Pore surface not bruising; cap reddish brown to yellowish brown; tropical and subtropical; spores 9-15 µ long. 2. Pore surface bruising blue; cap buff to straw-colored; widely distributed in eastern North America; spores 8-10 µ long. 3. Flesh staining dark purplish blue; usually woodland. 3. Flesh staining greenish to dark blue, without purplish tones; frequently in sandy, open areas or disturbed ground near the edges of woods--but also woodland. 4. 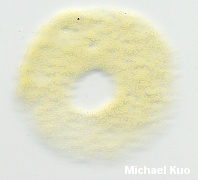 Cap yellowish brown, conspicuously hairy to scaly; spores 9.5-16 µ long; recorded from Florida. 4. Cap differently colored (purplish, reddish brown, dark brown, pinkish, pale), not conspicuously hairy or scaly; spores shorter than above; variously distributed. 5. Cap pale (buff, yellowish, pinkish); pore surface bruising slowly pinkish brown; in sandy soil on the East Coast and the Gulf Coast. 5. Cap more highly colored; pore surface not bruising; variously distributed. 6. Fresh cap and stem wine red to purplish. 6. Fresh cap and stem brown to chestnut brown or reddish brown.